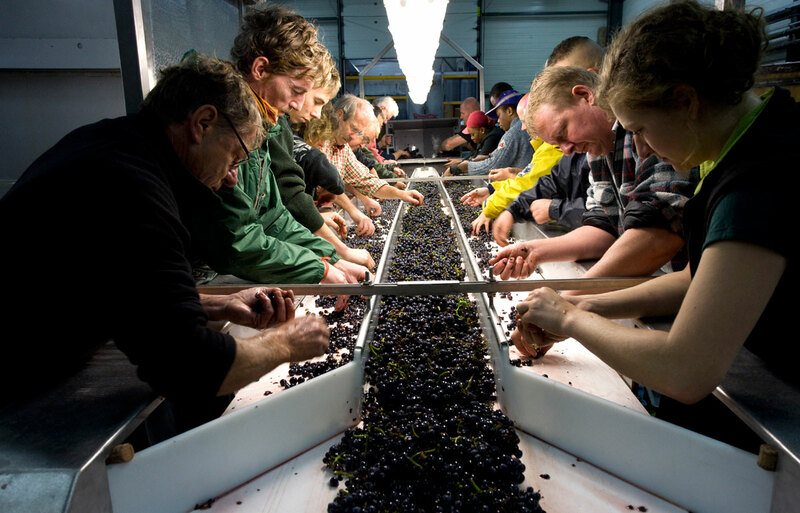 There are years where the fickleness of the weather prevent the even ripening of all the grapes on the bunches, and as the grapes cannot be harvested before the stems themselves fully ripen, on these years any extra ripe grapes will detach themselves from the stem while on the “table de tri”(sorting table). Since the traditional Burgundy vinification methods require the grapes to be fermented “entière” (in whole bunches) the loose berries are not used, despite being wonderfully ripe. However, taking all of these loose berries from every vendange, every cuve, permits us to unite all of our best crus and create one “cuvée spéciale”. This “tri” (selection) has in effect been made by the grapes themselves hence the name Pinoterie (Pinot-tri, understand the pun?). Natures choice, ripe voluptuous fruit, sheer pleasure. At this time there are only two vintages available: 2010 and 2011.